While camping in the summer is traditional, the spring, fall, and winter months offer entirely new possibilities for outdoor adventures. Unfortunately, cold weather during these seasons often keeps campers at home, as tents become frigid very quickly. With a tent heater, however, you can stay warm in the outdoors any time of year. These devices are ideal for the unique requirements of camping, and many are built to heat different sizes of tents. Heaters for tents come in a variety of forms and in several different price ranges. Some campers are hesitant to use a heater within their tent for safety concerns, including fire and carbon monoxide poisoning. Fortunately, nearly all products on the market today include some kind of safety system, so campers can stay warm and keep their peace of mind. This article will detail the main types of heaters, the brands which offer the leading products in the field, and will review the best camping heaters available today. The main drawback of electric heaters is their need for an electrical hook-up, which are not found at every campsite. Electrical hook-ups need a specific electric fitting, so an extension cord you already have on hand may not work. Also, these outdoor outlets may only be able to provide a limited amount of electricity. This aspect of electric heaters is somewhat inconvenient. But, electric heaters are still widely recommended for camping because of their high level of safety, especially compared to propane heaters. There are several excellent camping heaters available for sale today. Below are five leading models to impress even the most demanding of campers. The Mr. Heater F232000 MH9BX Buddy is one of the most popular tent-safe space heaters around. It provides a high level of propane-powered heat (4,000-9,000 BTUs to be exact). Mr. Heater has designed this Buddy model for advanced functionality that is simple to navigate, with a swivel-out fuel connection, easy-start four-position control, and a liberally sized, porcelain coated heating surface. The wide heating surface allows this device to heat tents that are up to 200 square feet in surface area. This heater is highly portable with a fold-down handle that also saves storage space. Mr. Heater takes safety very seriously. The MH9BX Buddy includes low-oxygen safety shut-off to protect against carbon monoxide poisoning, as well as tip-over safety shut-off to reduce the risk of accidental fire. Also, the Piezo igniter sparking mechanism starts the heater when you rotate and push the knob, making for a safer start-up. The MH9BX Buddy is approved for use outdoors and indoors; it is also clean-burning and almost 100% efficient. 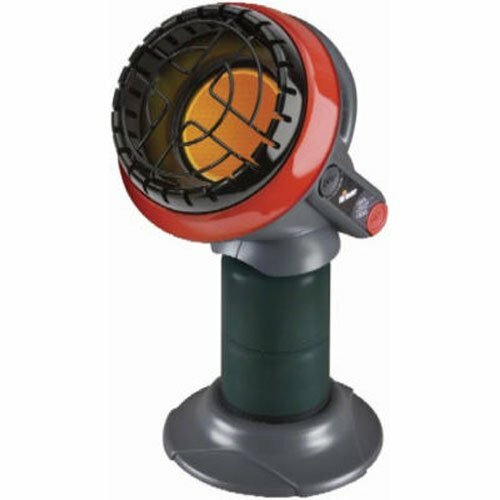 This product is one of the most popular and top-rated camping heaters around. 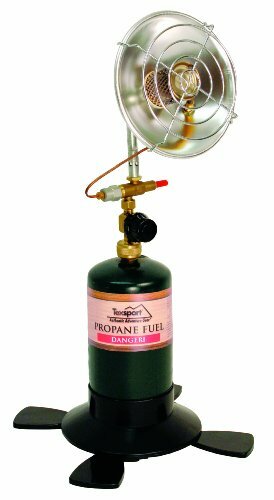 The Portable Outdoor Propane Heater is an affordable and well-recommended product in the camping equipment realm. 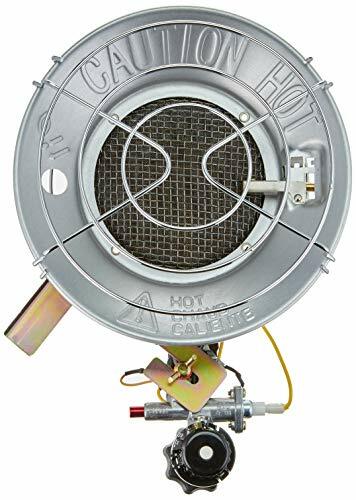 It uses a 16.4 or 14.1 ounce disposable propane fuel cylinder, stainless steel burner, and wide paddlefoot plastic base to provide steady, powerful heat. An individual regulator on/off control knob allows for the user to adjust the heat up to 2,890 BTUs. The Mr. Heater MH18B has been named “The Big Buddy” for its powerful yet portable heating capacity. It can heat up to 400 square feet of surface area with three heat settings: 4,000, 9,000, and 18,000 BTUs. The MH18B produces this high level of heat by using radiant heat with convection air flow together for an effective result. The installation of a propane cylinder is simple with the swivel-out regulator mount, and the attached swing-open cylinder hatch doors allow for an additional layer of security. As with all Mr. Heater products, thorough safety precautions have been taken with the MH18B. A low oxygen sensor and tip-over safety switch shut-off control the heat source to ensure safety during use, as does the heavy-duty safety wire guard. Also, the built-in Piezo ignition starts up the heater without the need for an open flame. The MH18B can be adapted for extended use with a 20-pound propane cylinder by using a hose that is either 5 or 12 feet in length (not included) and a fuel filter. A hose storage bay accommodates hoses for simplified storage. The Big Buddy Heater is CSA certified. ‘Few heaters around today have been made specifically for use in a camping tent; the 9401-50 Tent Heater from Allegro Industries is one rare example. While it is expensive, this heater is fully equipped to make your next camping trip more comfortable. The green all-steel housing ensures exceptional durability, along with the all-enclosed tube heating elements and the sealed motor. Additionally, a built-in 5 blade fan works to efficiently circulate heat throughout your camping enclosure. In an Allegro Work Tent the 9401-50 heater can raise the temperature by roughly 50°F. The burning rating is 1500 Watts of 5,000 BTU heating power with 115 CFM flow. 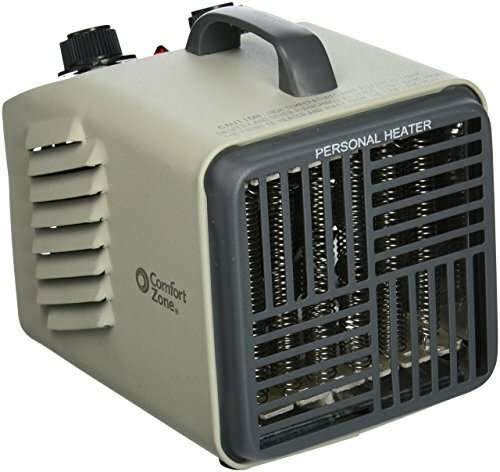 The 9401-50 heater from Allegro includes a handle for portability and weighs fourteen pounds. It has been both CSA and UL approved. If you are looking for a smaller version of Mr. Heater’s powerful products, the Little Buddy could be just for you. At just five pounds and with a fold-down handle, this heater is portable and easy to store. With two heat settings of 4,000 and 9,000 BTU per hour, it can heat a surface area of up to 95 square feet with up to 5 ½ hours of continuous odor-free heat. The Little Buddy Heater is safe and easy to use. The simple on/off buttons and Piezo igniter do not require an open flame for ignition. The large heating surface is coated with porcelain and protected by a high-temperature wire guard. A low-oxygen safety shut-off and tip-over safety shut-off give you protection from carbon monoxide poisoning and accidental fires. 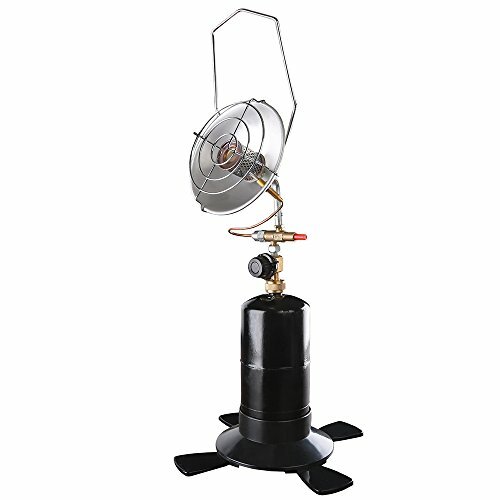 This portable propane heater can produce up to 15,000 BTUs with match light ignition. Its protective features include a safety shut-off valve and rear safety guard. Electric tent heaters can be difficult to come by; this one from Lasko features a simple on/off switch, 200 watts of power and is very portable. This quiet operating radiant propane heater includes a safety shut-off and a 1-year warranty. It produces 8,000-15,000 BTUs. You can control the heat level of this product with its four-step control settings, and it products 3,100 BTUs of heat. A metal dish directs the heat according to your adjustments. This durable all-metal heater and fan includes two heat settings, a fan-only setting, and an adjustable thermostat. The high limit safety fuse and power/caution indicator lights make up this heater’s protective features. Heaters for camping in tents are a tricky product to shop for. Most tents are made out of thin material, like nylon or polyester, which makes them poorly insulated. So campers can get cold very quickly, especially during the fall, winter, or even early spring months. Before you decide on a heater, know the size of your tent. Larger tents will require a more powerful heater with more circulation. The warmth produced by gas heaters is usually measured in BTUs, or British Thermal Units. A BTU is a standard energy unit commonly used in the US and the UK for heating and cooling appliances. The higher the BTUs per hour, the more heat will be produced by the heater. If you have multiple sizes of tent, look for a heater with multiple heat settings. No matter which heater you decide to use, there are dangers to keep in mind. Electric tent heaters come with the risk of electric shock. To reduce this risk, set up your heater off of the floor of the tent. If possible, use the heater to warm up your sleeping area before, not as, you fall asleep, so that no accidents happen during the night. Keep a safe distance around your heater at all times, and keep an eye out for the cord, which can easily be tripped over if inconveniently placed. The above precautions are a good idea for gas heaters as well, along with a few more safety tips. Make sure to have some kind of ventilation in your tent when you use a gas heater. This is due to the fact that propane heaters create carbon monoxide as a side product. Heaters available today include features to prevent carbon monoxide poisoning, but it is still wise to know the symptoms, which include: dizziness, weakness, nausea, vomiting, confusion, tiredness, and headache. By carefully monitoring the heater, the air in your tent, and with proper ventilation, carbon monoxide will not be an issue on your camping trip. 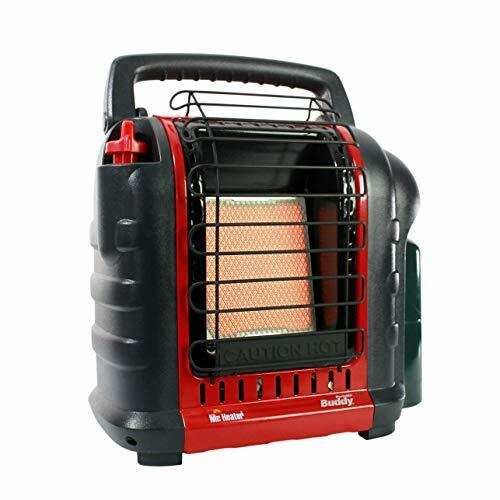 The two main types of tent heaters are propane and electric. These categorizations are based upon the fuel source of a heater. While both kinds can work well to warm up a tent, each comes with individual benefits, risks, and aspects to consider. Propane heaters make up the majority of heaters made specifically for camping available. These devices burn propane in order to produce heat, eliminating the need for an electrical outlet and allowing for portability. Propane is an affordable fuel source and is easy to obtain, although you will need to calculate the amount of propane to bring before you set off for the campsite. Propane heaters are powerful, making them great for heating up a tent completely and efficiently. Unfortunately, this also makes fires a heightened concern. To combat this risk, most companies include extensive safety features, such as automatic tip-over shut-off and push button ignition, with their products. Catalytic propane heaters work without an open flame, which further decreases the possibility of an accident. The other danger associated with propane is the emission of carbon monoxide. Carbon monoxide poisoning is a serious risk that may result in death. Oxygen depletion systems, or ODS, automatically shut off a propane heater if the level of oxygen in the tent falls. Also, make sure your tent has proper ventilation before turning on a propane heater. Given that you will have access to an electrical outlet at your campsite, electric tent heaters are a simple and safe option for warmth. These heaters use mains power or battery power as their fuel source. While propane heaters are great for very large areas, electric heaters are better suited to heating up smaller areas. And, without the risk of carbon monoxide poisoning, electric heaters are the best choice for tents without ample ventilation. Electric heaters work without an open flame, so the danger of fire is low. Additionally, most include safety features which automatically turn the device off if it tips over or overheats. 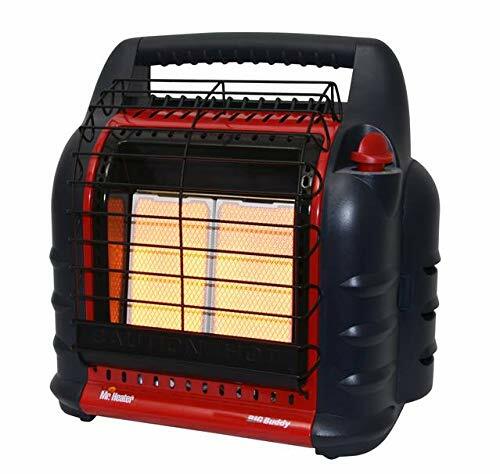 Electric heaters are highly portable and don’t require you to bring tanks of fuel, which is very convenient. There are a few different brand names that provide the leading heaters for camping on the market today. It is wise to purchase from a trusted company in order to ensure the reliability of the product. Mr. Heater is a brand from the company Enerco. From its base in Cleveland, Ohio, Enerco has been one of the top names in the infrared combustion technology field since 1955. Mr. Heater began in 1984, and has since become the most popular heater brand among consumers in the US. This brand has put out ground-breaking heater technology, namely “The Cordless Hero,” (the first ever cordless forced air heater), and “Quiet Burner Technology,” which allows for 50% quieter forced air propane heaters. The company even offers an outlet for idea submissions, giving you the chance to contribute to Mr. Heater’s inventive product line. Mr. Heater offers a range of products for sporting purposes, general outdoor use, in homes and at jobsites. Their leading-edge camping products include stoves, instant hot water heaters, LED lighting, washing machines, portable showers, refrigerator/freezers, and, of course, heaters. Many options, including their Buddy Heaters range, are ideal for tent heating purposes, with extensive safety features and innovative design. Mr. Heater boasts a top-notch customer service set-up, with a portal to answer questions and the ability to contact the team with ease through their site. You can feel confident buying from Mr. Heater knowing that it is a trusted, innovative name in the heater industry. Texsport is a manufacturer of top-notch camping and outdoor recreational equipment. Around for more than fifty years, this brand distributes their products to sporting goods dealers and other retail outlets across the globe, as well as online. Texsport is a family-owned company, and the current second generation leadership works to make quality and affordability a priority. Texsport offers a sweeping variety of products to fulfill all of your camping needs. Some of their offerings include tents, air beds, sleeping bags, cots, hammocks, propane appliances, cookware, compasses, lighting, rainwear, backpacks, grills, and more. Additionally, Texsport provides detailed instructions with step-by-step photographs for each of their products which require assembly, enhancing ease of use and setup. Whether you are an expert adventurer or camping for the first time, Texsport has the gear to make your outdoor experience one to remember. You can check out their online catalog for the complete product listing for this year. Allegro Industries has been manufacturing top grade safety equipment for nearly three decades. This company spans a wide array of product categories from ventilation and confined space equipment to eyewear maintenance and ergonomics. The specificity of these product divisions allow for greater quality control and heightened innovation within each niche. Allegro Industries is based in Piedmont, South Carolina, but operates internationally, providing their products to various distributors and industries. The company also offers thorough customer service to consumers everywhere with sales representatives and sales managers open for contact in multiple regions. 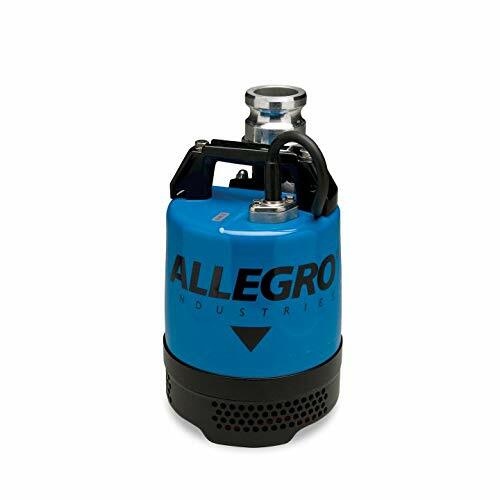 Within their confined space equipment category, Allegro Industries manufactures a heater specifically for use within a tent. This serves as just one example of how Allegro Industries is able to cater to the individual needs of particular consumer groups to achieve high levels of satisfaction. In addition, Allegro continues to provide advanced technology in their stock by periodically releasing new product lines. Heaters for tents are a must-have product for adventurous campers, especially in chilly weather. Many people are skeptical about using a heater in a tent because of safety concerns, as both gas and electric tent heaters pose multiple risks. But thanks to modern technology, there are several excellent options for safe heating devices for heating the inside of a tent. Also, as you have learned in this article, there are numerous trusted brands which have been manufacturing top quality camping equipment for years. So don’t be afraid to hit the camping trails during unconventional times of the year. With a fantastic heater, you can enjoy the outdoors at anytime and in any weather with the comfort of a warm sleeping area.